After the Civil War, herds of Texas cattle were driven north to marketing points in eastern Nebraska, but settlement by homesteaders forced the trail further west each year. Beginning in 1875, Union Pacific selected Ogallala as its main shipping point. During the following decade, thousands of longhorn cattle were trailed through Perkins County, in the vicinity of this marker. Beginning in Texas the trail turned northward through the Indian Territory into western Kansas. From Dodge City on the Arkansas River, the trail continued to Buffalo Station, Kansas, entering Nebraska in Hitchcock County. The hardest day's drive for the trail-weary men and cattle was the 30 miles from the head of Stinking Water Creek in southeast Perkins County to Ogallala on the South Platte; it was the longest and driest drive of the trip. In 1876 over 60,000 Texas cattle were driven over the trail, and between 1879 and 1884 over 100,000 cattle made the trip each year, with the last great drive occurring in 1884. Due to settlement in the counties to the south, as well as in Perkins County, the last drives were made through the western part of the county. 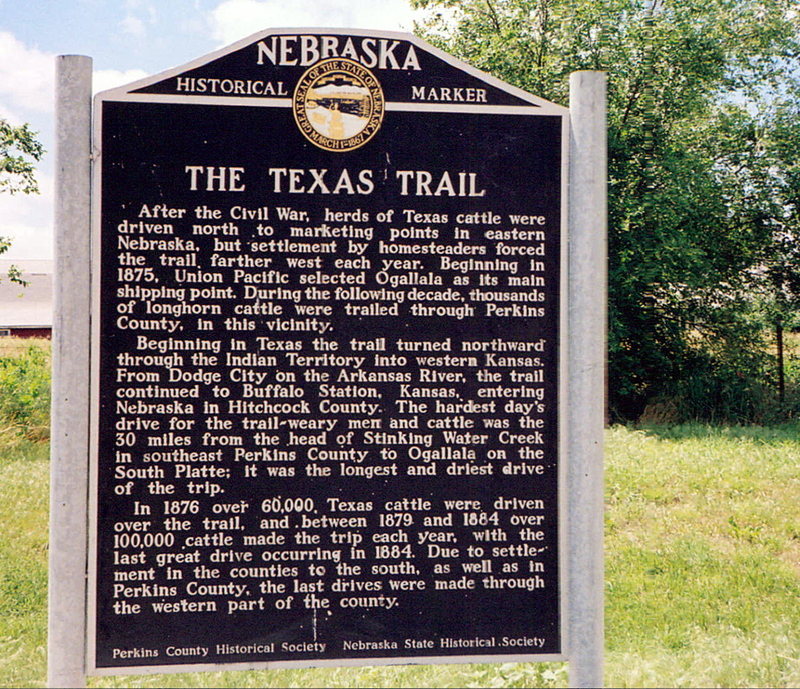 “The Texas Trail,” Explore Nebraska History, accessed April 18, 2019, https://mynehistory.com/items/show/397.